Sick of answering messages all weekend? Freshdesk can work perfectly as an Amazon and eBay autoresponder, with messages even counting toward Amazon’s 24-hour response time SLA. All you need is ChannelReply and a special Dispatch’r rule. Use Zendesk instead of Freshdesk? Read this instead. Click on any image to view it at full resolution. Last updated 4/3/2019. This autoresponder system generates messages once every half-hour. It could be up to 35 minutes before an auto-reply appears on a Freshdesk ticket, so keep calm and carry on if nothing happens right away. You can safely answer your messages at any time. If an agent sends a response before the auto-reply appears in Freshdesk, ChannelReply cancels the auto-reply and delivers your message immediately. The customer will only see the human response. The message you want the autoresponder to send. You can write a simple one-paragraph message in plain text, or create something more elaborate with all formatting written in HTML. 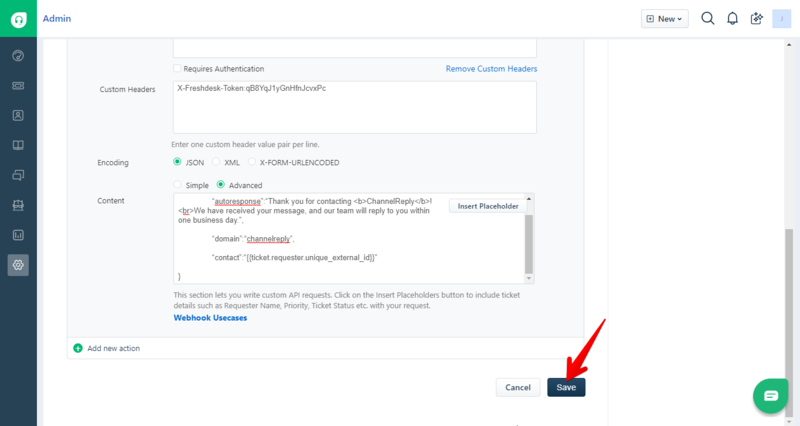 Admin access to your Freshdesk account. The Freshdesk API key you currently use for ChannelReply. To find this, sign in to ChannelReply and go to (2) CRM settings. We recommend having everything above in easy reach before proceeding. Important: When we show text in brackets [random text here] and say it should be replaced, remove the brackets as well as the placeholder text. For example, if your API key is 123456789 and we show [your API key], you would just enter 123456789 with no brackets. In Freshdesk, go to Admin (the gear icon on the left). Scroll down to “Helpdesk Productivity” and choose Dispatch’r. A single Amazon or eBay account. Any combination of Amazon/eBay accounts. Every single message that comes into Freshdesk. Whichever option you choose, the messages it sends will not count toward any message limit in ChannelReply. Once you’ve decided how you want the autoresponder to work, give it a name. We’ll use “Amazon/eBay Autoresponder” in our example. If you want the autoresponder to work for all messages, not just Amazon and eBay, skip to step 4. The tag(s) you enter will determines which marketplace account(s) this rule will work for. For example, if you only enter the tag of one eBay account, this autoresponder will only go off when it receives a message from that one account. If you enter all your ChannelReply tags, it will go off for any message delivered by ChannelReply. That will make sure customers only receive automatic replies when nobody’s available to help. If you entered a condition with tags in Step 3, you need to leave your conditions set as “Match ALL of the below.” In that case, you should only use one timing condition. Want to have an autoresponder that hits both non-business hours and holidays but can’t because you’re using tags? No worries! Step 6 will explain how to create a clone of this rule, which you can then customize for the holidays. Be sure to replace [your Freshdesk API key] with your actual Freshdesk API key—don’t enter the one shown in the screenshot below. Carefully replace [Your message here] with your actual message and [Your Freshdesk domain] with your domain. Leave everything else in place. That’s it—your autoresponder is in action! Give the clone a new name. Change the conditions as desired. Update the message in the Content field as needed. Make sure all the code surrounding the message stays in place, especially the quotation marks surrounding it. Within minutes, you can have an army of autoresponders ready for action! We’ll be happy to help you set up your Amazon/eBay autoresponder in Freshdesk. Contact us and we’ll get back to you ASAP.